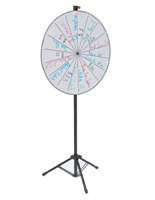 Looking for a way to engage with passersby at the next convention? 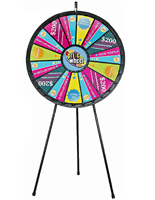 Floor standing games like prize wheels and drops are a great solution at promotional events. 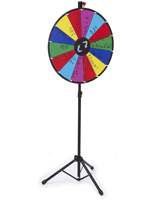 Advertise products, teach in classrooms as a part of a fun learning activity, promote at trade shows, or use them in a corporate office for team building exercises. 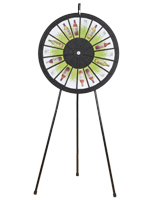 These attractions are available in a variety of styles to fit any setting. 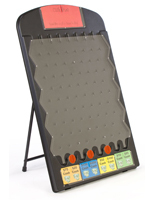 Floor standing games come in both economical and more expensive options, and any model is portable to be brought to events on-the-go. Regardless of how you plan on using these prize contests, we know we’ll have an option for you. 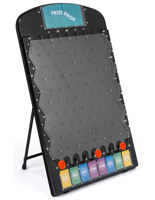 Browse our large catalog of floor standing games to find exactly what you’re looking for. What types of activities can I choose from? 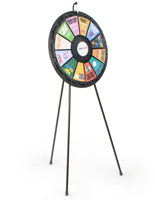 Floor standing games include prize wheels with printable templates that can hold 12-24 graphic slots. These slots can be customized to your liking, letting you be in the control of the activity completely! 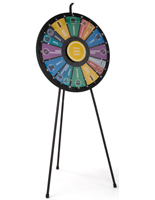 Create your own contests and customize the wheel with your company logo for extra branding power. 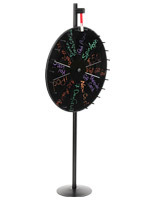 Some are adjustable and even have LED lights to add extra flair to your display. 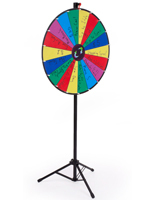 Prize wheels with numbers and write-on surfaces are the more economical option for trade shows or temporary events. These fixtures are lightweight and portable. The write-on feature lets users create their own activities and contests on the fly. 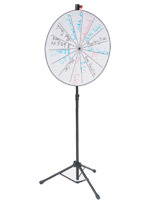 Many of these spinners have adjustable legs as well or are made of cardboard to easily set up and break down at events. 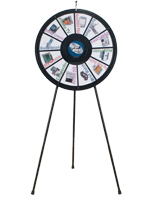 Prize drops are a fun and engaging way to connect with customers or passersby at trade shows and events. 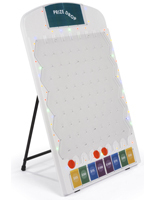 Each game comes with three pucks and holds up to eight slots, and some even have flashing LED lights. These slots have downloadable templates where users can customize the prizes. This is a great feature because prize slots are found in all types of environments! 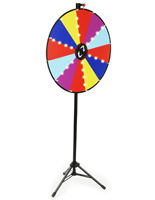 It’s important to make the environment fun, whether it be at a trade show, a classroom, or corporate office. 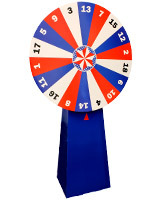 Incorporating a prize wheel or drop activity can help build rapport with your audience and even help sell merchandise. 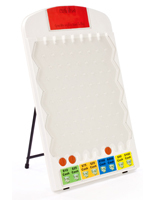 Promote your brand or your products in a fun and engaging way. 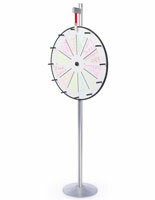 Choose Displays2go to bring fun and games to your business!